Since it's the 5th Sunday, I have the whole time. We'll be playing Primary Program Singo (similar to Bingo). I've made the Bingo cards generic so you can use them every year! Make sure to bring your 2010 Outline for Sharing Time booklet, it will help you out a lot with this activity. At the bottom of the post are 24 DIFFERENT Singo cards I've made (calling card sheets are linked at the bottom of this post). I put my Singo cards in plastic cover sheets. Then I cut the calling cards and laminated them. In each plastic cover sheet, I threw in 25 small squares of colored card stock so the kids can cover the items as they are called. When we are finished playing the activity all their pieces will go back inside the cover sheets - keeps it easy. Hope that makes sense. These are pretty easy songs that we'll be able to go over a few times when we review these next few weeks. If your ward isn't doing this, you can still sing these songs when they are called as they do go along with that month's theme. If your primary doesn't know them, try posting the words up front or pick something else they will know. And for convenience sake, write these songs with the page number in your 2010 Outline in the right month. You may also want to fill in the songs you picked for May and August too! 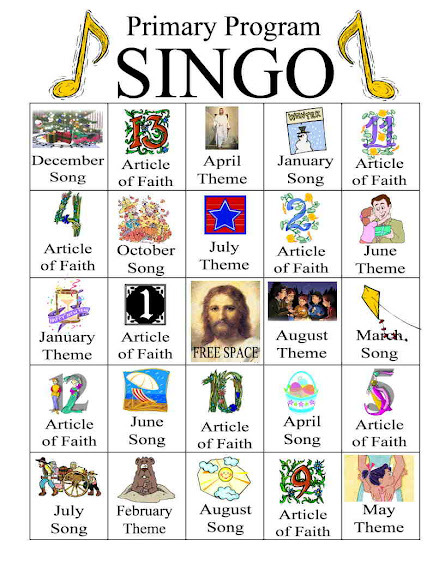 When the monthly themes are called, either me or a child will read the monthly theme in the microphone (it's the scripture or Article of Faith listed in the 2010 Outline for Sharing Time for each month). When a child gets 5 in a row, they yell "SINGO" and get some reward - candy, their teacher has to wear a crazy hat, whatever you want. You can go for blackout too if you have time. 1. Partner up. Put an older child with a younger one. 3. Make two big ones on the chalkboard and have teachers vs. children (also great for Jr.). If you do this option, just print out all the calling cards, hang them on the chalkboard and draw the bingo card lines. Make sure you have 48 cards printed and then just write "FREE SPACE with chalk in the middle. Here are all the cards. Let me know if you have questions. UPDATE: Find the PDF version HERE. Sorry if they are a big pixelated - I made these several years ago and only saved a JPEG version. So to get them into PDF, I copied the JPEG into a Word Document and saved it as PDF. Hope it helps, however! I absolutely LOVE this idea and was actually thinking of doing the same thing this upcoming 5th Sunday...I just wasn't sure how I was going to do it until I read your post so THANK YOU SO MUCH! I would love to copy your singo card sheets as well as your individual singo cards but I'm not quite sure how do download and print them. How do I go about doing that?? Thanks for al your help! never mind.. I got it to work!! Thanks again and I can't wait to use your idea this Sunday! I LOVE it! However, so sad that I can't get it to work. Please help me so I can use your wonderful idea. Kimberly, I clicked on each of the pictures and then copied and pasted them into a Microsoft Word document. Then enlarged the image so it fit the whole page. Is that what you've tried? I have not tried that. I will try it right this very minute! Thanks. I copy and pasted to my desktop and then was able to work with them from there. These are AWESOME!!! I love that they can be used from year to year! Thanks for putting in the work and being willing to share with the rest of us. I love this idea. I tried copy/paste and also saving them but either way when I try to make it an 8.5x11 the whole thing is very pixelated! Any suggestions? Hi Liz, I know, lame. Sorry. The software I use will only let me export my files as a JPEG (or picture). I can't print to PDF either. What I'd maybe suggest is to print these landscape, not portrait and centered on the page. The picture will be smaller and not as pixelated. Not perfect, but better. My only other idea would be for you to try to replicate each one but that will take some time. I'm working on switching programs here soon and hopefully the new one will be more versatile so I can attach better quality images.